This is Part 3 of the series that aims to identify future classics from within the ranks of modern Rolex watches - areas perhaps that vintage collectors have not paid attention to. Historically, if one looks back at the many different vintage Rolex watches that have drawn collectors attention, one finds subtle nuances in the dials that cause the attraction. For example, when a dial has something that differentiates it from the vast majority of dials in a reference, it becomes much rarer and thus something of a challenge for the collector. Many gilt Subs from the 1960s and 70s have these quirks on their dials that subsequently led to them becoming highly sought-after icons. Attention on these vintage pieces has been intense. So intense, in fact, that few seem to have paid much attention to the more modern references that have similar dial anomalies. It is often assumed that the modern Rolex is something of a commodity and is essentially identical to the next modern Rolex. This is very much not the case. This article will highlight a very real dial anomaly that will evolve into another “quirk” that allows Rolex collectors to differentiate between a single reference and turn what was once a common reference into one that has some real rarity within it. 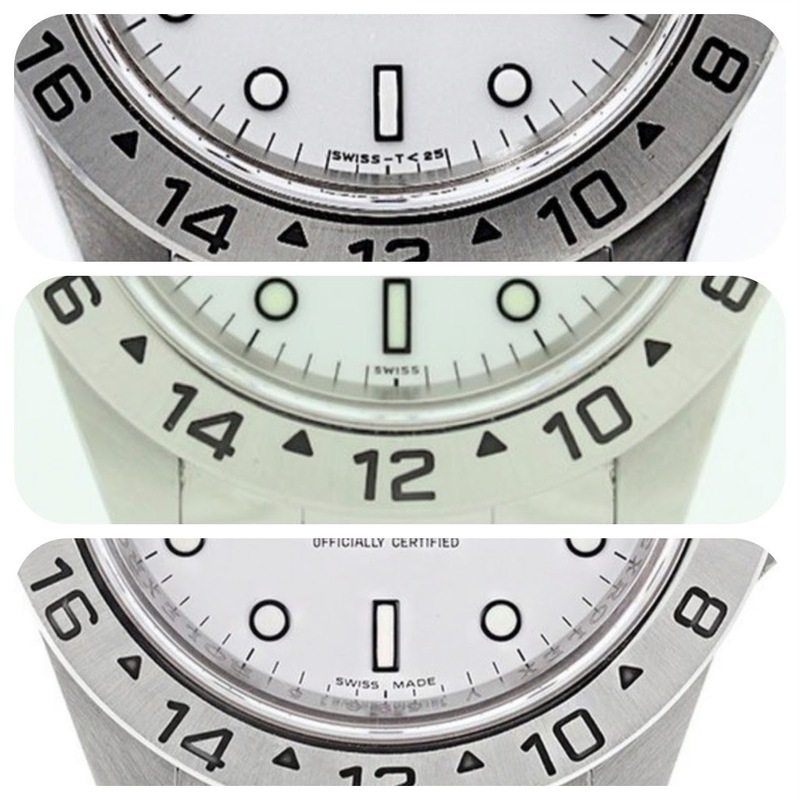 I think it is probably true that Rolex collectors love these dial anomalies because it differentiates between watches that look so similar. But when there is a dial anomaly, it places the watch as much harder to get and thus collectible. The hunt is always a big part….. The phenomenon that I want to draw attention to focuses on the transition from Tritium dials to Luminova dials to Super Luminova dials. This transition happened in 1998-1999. Rolex shifted from Radium to Tritium in the mid 1960s. Tritium persisted on Rolex dials up until around 1998, In 1998, Rolex started issuing watches with Luminova on the dial. They switched to Super Luminova in 1999. This single phenomenon has unwittingly created a wealth of anomalies on dials. Why? Because Rolex marks the shift by making changes on the dial. In the vintage world of the 1960s, the existence of an exclamation mark at 6’o clock or an underline on the dial has led many to argue that it was Rolex’s way of differentiating between Radium and Tritium. Modern Rolex does exactly the same thing between Tritium, Luminova and Super Luminova. However, in the modern examples, there is a very clear factor that differentiates between the three. And it is this differentiator that, I believe, will create a number of modern rarities that collectors will want to hunt down. 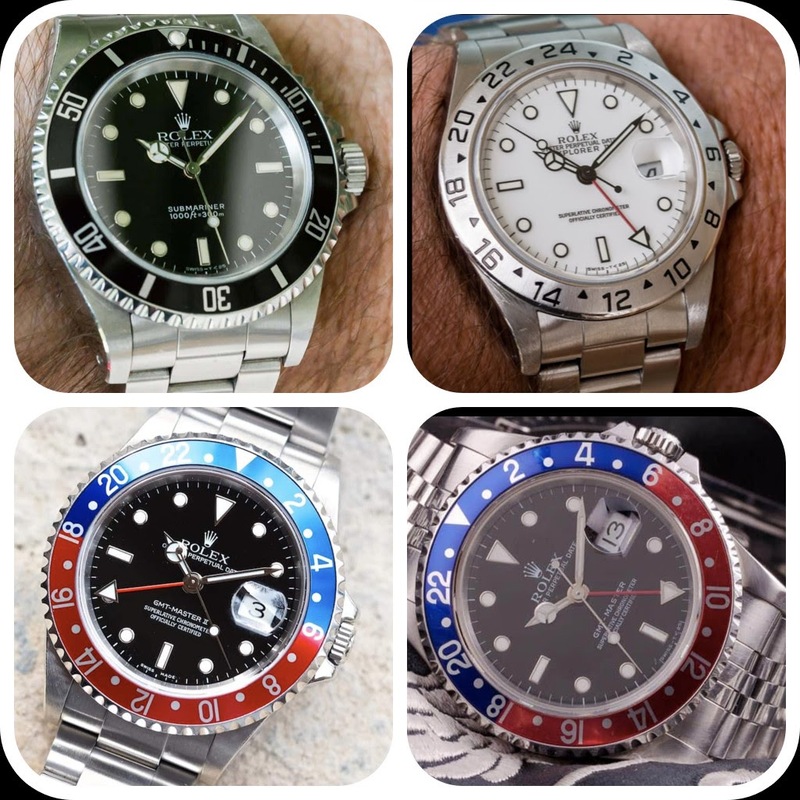 These variants are, without doubt, very rare examples and I will illustrate four such examples in this post using the GMT 16700, GMT 16710, Submariner 14060 and Explorer II 16570 as references. Before 1998, the marker at 6 0’clock on a Rolex dial would typically have a Tritium indicator of the nature “Swiss - t < 25”. The move to Luminova saw this replaced by the word “Swiss” at 6 0’clock. This happened in 1998/99. Super Luminova saw this replaced to “Swiss Made” from 1999 onwards. So, how does this reflect itself in different references? The following looks at the “Swiss” only effect. In production from 1988 through to 2011, this is not a rare watch. A quick scan on Chrono24 throws up jaround 500 for sale globally. From 1988 through to 1998 they all typically had Tritium dials with Swiss - t < 25 on the dial. There are about 165 on Chrono24 of this type. From 1999 onwards, they all had Super Luminova and “Swiss Made” on the dial. There are about 300 of these on Chrono24. But what about between 1998/99 with just Luminova and with just “Swiss” written on the dial? I can see 20-30. A “Swiss” only dial on a 16570 represents approximately 5% of the 16570 reference based on this sample. Its priced at exactly the same level as the rest of the 16570s, yet it has a definitively rarer dial. This will be on a late U-series or an A-series serial number. I am not pretending that this is going to become as prized as a Paul Newman, but in the spirit of identifying anomalies that are priced at very low levels that could become sought -after and desirable hunts, this is definitely one. Unlike its predecessor, the 16570 has a Red hand rather than an orange hand. This particular variant of dial has a Swiss Only. And it is an Explorer. Red. Swiss. Only. Explorer. Red. S. O. X Calling it the "Red SOX” seems appropriate (credit to Mr Green for the discovery). The Rolex GMT-Master II 16710 is a great watch. It has so much to like about it. It will feature in a subsequent post where more details of the watch will be given, but for this post, I will focus on just the chronology issue. It was produced from 1989-2007. Again, it is not a rare watch. I can see just under 400 for sale on Chrono as a sample. About 100-115 come from the pre-1998 Tritium era. 250-260 come from the post-1999 Super Luminova era. 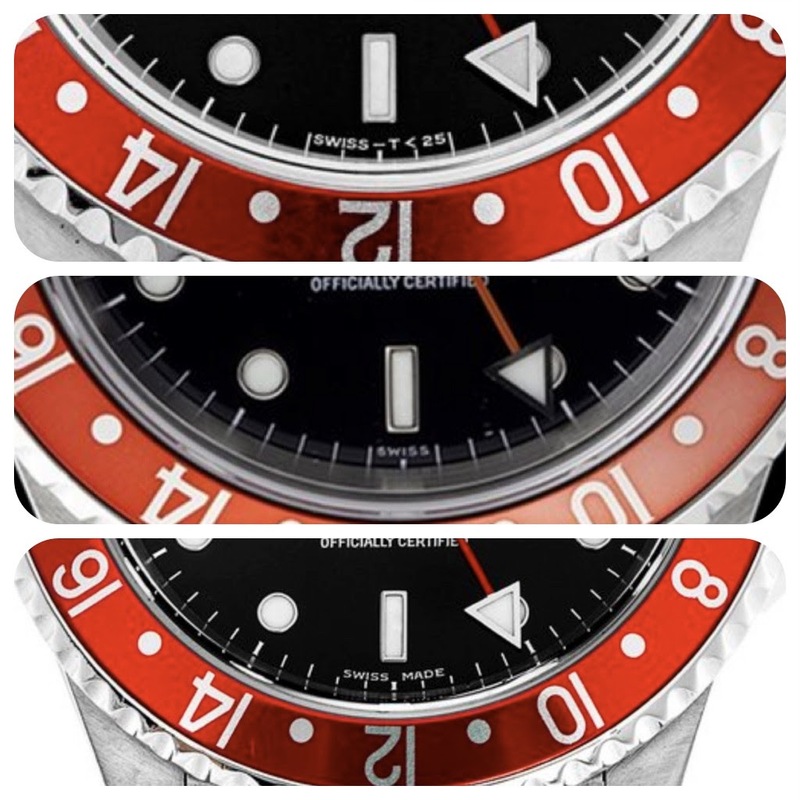 How many, then, have the “Swiss” only dial representing just Luminova? I can see just 12. Again, what we have here is a reference that is not rare but one that has a very rare variant dial. The “Swiss” only 16710 GMT is priced no differently to other 16710s, yet it is very rare. Late U-series or A-series serial number again. This one is slightly different. Produced from 1988 to 1999, its end of production coincided exactly with the switch from Tritium to Luminova to Super Luminova. However, in this instance, the end of the production curtailed the Super Luminova so much that hardly ANY “Swiss Made” dials exist. The usual rules apply here. The “Swiss” only is a rare variant of this reference. But in this instance the “Swiss Made” is extremely rare. How many16700s on Chrono24? About 140. How many Tritium? About 110-120. How many “Swiss” only? About 15-20. How many “Swiss Made”? Maybe 2 or 3. This is a very rare variant. As a reference, the 16700 was the very last GMT-Master. Late U-series or A-series serial number. The watch was worn by the character Raymond Reddington in the Blacklist. I am quite tempted to call it the Reddington. On the other hand, it is the last GMT-Master, the last master.......which brings up the Star Wars “last Jedi” idea. Either way, the 16700 is a very desirable watch to own. Of all modern Rolex, the 14060 has the closest resemblance to the Submariner 5512/13. The simplicity of the dial and the purity of the watch makes the 14060 a tremendous modern Submariner to own. It has so much of the vintage DNA with it, yet at the same time it has all the mod cons of a modern watch, with sapphire crystal and a solid reliable movement. This is a watch that can be worn every day without any worries. Produced from 1990-2002, a production range that spans the crucial 1998/99 period, when Rolex shifted from Tritium to Luminova. It is not too hard to find a 14060. I can see around 150 for sale at the moment. But, how many with just “Swiss” only on the dial? I can see 5-6 for sale globally. That makes it a very rare dial variant. Late U-series or A-series serial number. Giving this one a nickname is not so easy. It sits amongst many more flambuoyant watches in this “Swiss” only group. The GMTs are more colourful and aesthetically overt. Yet, the 14060’s strength and (almost power) bullies its way into being a watch of considerable force. The "bully". With vintage Rolex, and by that I mean watches from the pre-1980s, a lot of potential collectors worry about the difficulty of replacing parts. There is no question, the watches from that era are more fragile. Radium lume can easily break free from the markers and from the hands. Radium itself is very possibly a dangerous substance in a watch. The steel in the vintage cases can easily become eroded. Repairing can become very difficult. Further, prices for vintage pieces have gone clearly through the roof and appear to be setting sights for the sky. Does it make sense to me that many collectors will start to look at Rolex from the 1990-2018 era as one that offers a very good alternative to the pre-1990 vintage era at a fraction of the price and with none of the issues? Yes, it makes a lot of sense to me. So there we have it - four more examples for my list of future Rolex classics. A dial anomaly across four references that will, in time, be recognised as very rare variants. The references are, themselves, lovely watches and so nice to wear. I think that is a very necessary feature of this process. 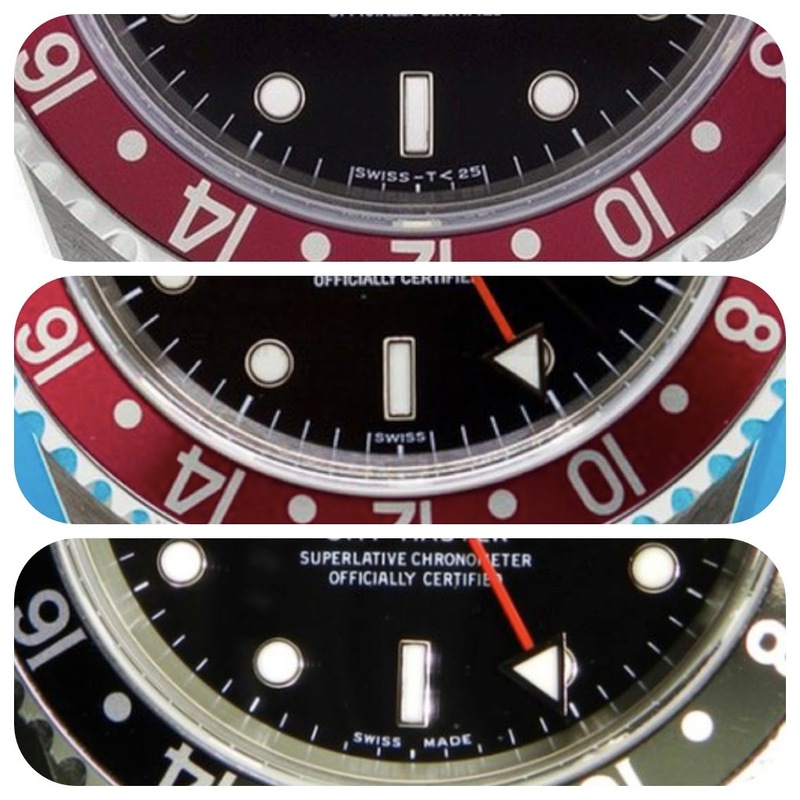 Typically, GMT and Submariner have been the references that have been the most sought-after, reflecting personal tastes as well as reflecting Rolex history. To that end, although I have included an Explorer II in this review, it is recognised that future classics will most likely be found where they have always been found - Subs and GMTs. The dial rarity of these models adds some real spice to the hunt. And, relevantly, there is no differentiation in price for these dial rarities. Which one is the Rockstar? Part 1: 16610LV - The "Kermit"
Part 2: 16760 - The "Fat Lady"
Thanks for another very interesting read. Your depth of knowledge never ceases to amaze me. Plus you keep pushing me towards where I don’t want to be pushed. Keep them coming, maybe I end up finding something for myself. ....it isn't necessarily knowledge as no sooner is it in my head than it disappears. At least with this, seeing "Swiss" only seems a nice and easy spot. Thanks Joe for an amazing post. makes me want to acquire a rolex.... I really found this interesting, thanks for taking the time to share! Well developed and articulated thought piece Joe, thank you. I've a couple further queries for you. The Swiss only always intrigued me when associated with Luminova. Thanks for this superb investigation, Joe. Thank you for another great post, Baron! .....though I could argue that the word "Observatory" on a HF makes a world of difference too.... small differences definitely matter. I thought it was something one could just get repainted on at will. .... as ever, we can all have our specific preference. I take rarity. You take Tritium. No harm. No foul. I like how you’re so detail oriented!